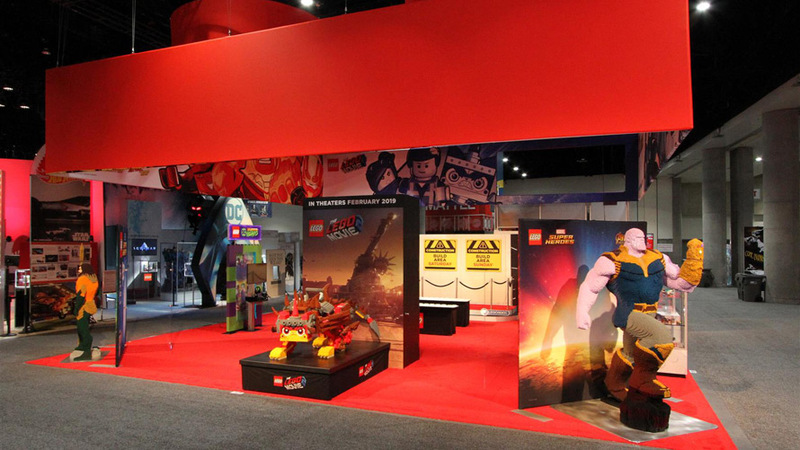 Creatacor was able to continue its partnership with LEGO in designing and producing another amazing Comic-Con booth. LEGO celebrates the 60th anniversary of the LEGO brick this year and what a better way to do it than with a massive 37’ LEGO brick suspended over the booth that could be seen from all points within the convention center. The booth utilized a double deck structure within their space. This upper level provided a valuable area where the LEGO team could set up for interviews and filmed content. The top deck also allowed the team to check out the action in the LEGO Experience Zone below. A video tower in the center of the booth had a giant monitor that played LEGO videos, including clips from the upcoming movie The LEGO® Movie 2™: The Second Part. Creatacor helped create an interactive and immersive experience as attendees were able to help build The LEGO Movie 2 mosaic on a large mosaic wall. Visitors were also able to create their own LEGO art on the LEGO graffiti wall. 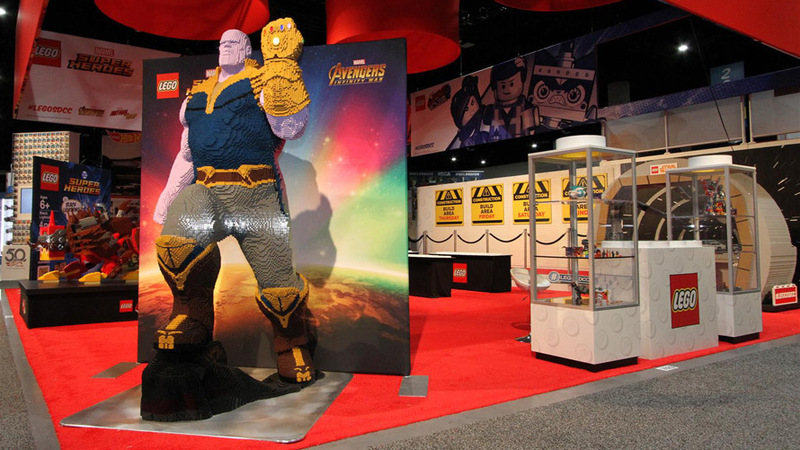 Life-sized LEGO models of Unikitty from The LEGO Movie 2, Marvel characters, Thanos and Aquaman, along with the Millennium Falcon Cockpit from Solo: A Star Wars Story were placed throughout the space, showcasing the amazing capabilities of the LEGO brick. Scaled up versions of the Deadpool and Black Lightning exclusives packaging were also in the booth for attendees to pose as LEGO Minifigures for fun photo-ops. A wall of show cases was setup in the booth to display the new and upcoming LEGO sets. The always packed, in-booth store was open for the continuous line of attendees excited to buy LEGO sets and the Comic-Con fan favorite LEGO SDCC exclusives.